Lawn aeration will benefit any lawn. If your lawn is old, well used or has weak, thin areas which seem to continue to deteriorate no matter what lawn fertiliser products you apply, then it is most likely suffering from a soil compaction problem. Compacted soil occurs due to the particles of soil becoming literally squashed together, eliminating the air gaps in the soil, preventing water, nutrients and gasses from getting down to the root zone. Consequently the grass struggles to grow roots, thins away, and in severe cases dies completely. It is a very visual problem. It causes browning of grass in hot weather and thin patches, especially on well-used areas of your lawn, such as at the end of paths. Your lawn may also drain poorly. Puddles of water may collect in low areas in wet weather, or the water just runs off, leaving the subsoil dry even during periods of prolonged rain. Lawn compaction is caused by many factors. Simply the passing of time and the falling of rain can be the main contributor. Other issues that exaggerate the problem can be high usage, mowing, foot traffic, and areas under trees. It can also be a sign of objects hidden in the soil, such as old paths or areas of concrete or stone. How do you know my lawn is compacted? I carry special tools to scientifically measure soil compaction. I will measure the level in several parts of your lawn and identify areas that are especially at risk. Lawn compaction is a very common problem in domestic lawns all over the UK. It is a very difficult, time consuming and expensive problem to treat effectively as a do-it-yourself lawn owner. The only way to remedy a compaction problem on a lawn is by relieving the soil stress by physically loosening the soil. This allows the roots to breathe once more. 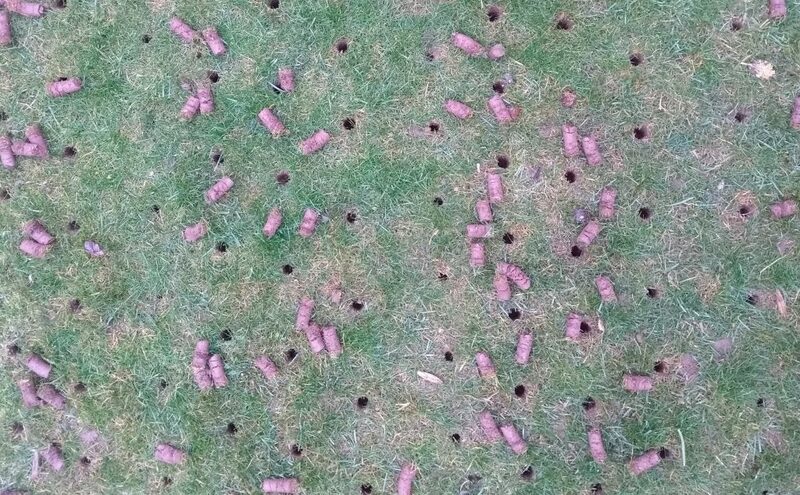 Aerating can be achieved by putting in a considerable amount of effort and time using a manual aeration tool. Or book a suitable aeration treatment with The Lawn Man. Ideally, it is best to keep your lawn properly aerated regularly to prevent soil compaction from ever becoming a problem. Even if your lawn does not exhibit any of the classic symptoms of compaction, it will always benefit from an aeration treatment. It is one of the most beneficial treatments you can apply to your lawn. Grass often reacts so positively to the treatment, that owners are often amazed. A simple mechanical process can produce a visually stunning improvement to their lawn. The Lawn Man offers two different types of Aeration treatments, and I will be able to advise you which one is most suitable for your lawn.